That's it until Easter, though if you want to make me rejoice before then, please visit this page. Childrens Mental Health treatment: Free, but 55,000 miles to the point of delivery. "We've had to section her on seven occasions, the first being in September 2013 - that was at Sevenoaks in Kent, she was there for about eight weeks." Since her first admission, she has spent periods in mental health hospitals in Southampton, Manchester, Woking, Norwich and finally Orpington in Kent. She has had to be treated hundreds of miles away from her home because there are no inpatient beds available in Somerset. Her parents have visited her virtually every weekend as she was battling her illness, spending £25,000 and racking up 55,000 miles of travel just to see her. "She would get put in different hospitals - from Southampton she was moved to Manchester for a weekend, and then spent four months in Woking. Many of these mental health hospitals are privately owned, they're profit-making organisations. Often it appears they never have enough staff." Her mother said that it was "heartbreaking" to be separated from their daughter by such huge distances. She said: "I feel as though I've missed out on two and a half years of our daughter growing up. You get a phone-call at night and she's crying her eyes out and you're like 250 miles away and you know there's nothing you can do to help her." "We've spent £25,000 over the last three years just to see our daughter - that's food, accommodation, petrol, taking her out to places, everything. A lot of other people can't afford to do that. We were told that either the NHS or the county council would reimburse transport costs, but we've heard nothing from either. There's no continuity of care. We've never been back to the same hospital; it's always a different psychiatrist or a different doctor, and it's soul-destroying." This is scandalous. It's enough of an ordeal to have an ill child, but how on earth is all of that supposed to help the child recover? This is not a one-off, it's happening repeatedly to adults as well as children, and school heads are now flagging up mental illness as a major concern. 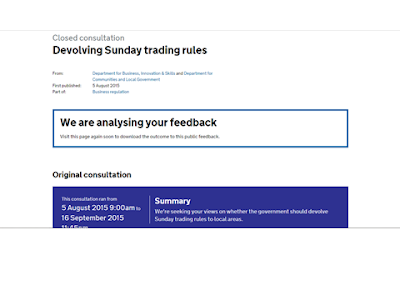 Sunday Trading: Is It a Consultation If Nobody Listens? Update: the government has published its response to the consultation. You can hardly see for the smoke and mirrors. It state that a majority of medium and large businesses wanted more Sunday trading (there's a surprise) as did a majority of local authorities (not a surprise, as the Conservatives run a majority of local councils). The words 'majority' don't appear anywhere else, so from that we can infer that a majority of small businesses, other organisations, and individuals, were against the proposals. There's no summary of these stats anywhere of course, the only bits of responses quoted are those supportive of the policy the government already has. There are surveys and statistics which show it has negative economic and social effect, but none of these are mentioned. The response is just as skewed as the initial consultation. CofE official response to the government response here. What do you do when you want to change a law but Parliament won’t allow it? Simple: you smuggle it back as a late amendment to another Bill which has already been debated by the House of Commons and scrutinised by the House of Lords. That way, there’s no prospect of a vote and so no embarrassing defeat. So the amendment won't be debated in the Lords at all. Democracy, who needs it? The Church of Englands response to this latest manoevre points out that the changes will damage family and community life, and lead to a net loss of jobs in the retail sector, mostly in smaller businesses. That probably won't bother the bosses of Next, or the Westfield centre, major donors to the Conservative party, who would be among those who stand to benefit from the changes. If taxation practice is made by deals with the biggest taxpayers, then sadly it wouldn't be a surprise if retail practice is worked out by deals with the biggest retailers. Here's a number of reasons why the changes are wrong, which I sent in to the consultation. I'm still waiting to hear what the government will do when it has actually analysed our feedback, rather than ignoring it. What is the point of consulting us Mr Cameron? I'd rather you saved everyone the time and were honest. Better still, pull the amendment now. Rt. Rev Guardiola, a pioneer leader with a great track record, has been made Bishop of Manchester. Once in charge, he'll discover that he can only change the team if players actually ask to leave, and has no control over the formation or playing style. Kit colours can only be changed after consulting with every supporter. Of every club. Rev. Mourinho is still in post, despite falling out with a churchwarden on the first day of the season, alienating most of the PCC, and a general lack of inspiration at the main gathering each week. A senior and loyal member of the congregation has had his pew removed, and the congregation is tiring of the sermon series on Passive Aggression, which has now been going for 6 years. Bishop Abrahamovic, having personally headhunted Rev. Mourniho from a neighbouring Diocese, is too embarrassed to ask him to leave. The only way to sack a vicar is to go through the cumbersome and costly clergy disciplinary process: thankfully for the Bishop, the churchwarden has initiated proceedings. Rev Dr Neville, a noted 1990s worship leader and well reputed church growth analyst, has joined the Roman Catholic church. It's early days, but the congregation don't appear to be enjoying the new songs. Preb Wenger is standing for the 20th time for General Synod. Under his leadership, Emirates Minster has become well known for the quality of its youth choir, the elegant choreography of the worship, and the thoughtful but understated homilies. Older members of the congregation still talk about the mission held in the late 1990s, supported by a team of Dutch evangelists, and wonder if this years generation of interns will ever repeat it. The Diocese of Leicester has experienced unprecedented church growth this year. However because Bishop Ranieri hadn't seen these kinds of results before, everyone is assuming it is a flash in the pan, and will go away. After all, we've so much experience of failing managers that we know what to do with them, but success is unfamiliar and unsettling. Archdeacon Vardy is being lined up for a role with a national coaching agency.